Posted on September 15, 2013 by caseybergman. This entry was posted in academic life, lab management, social media. Bookmark the permalink. There should be some type of recognition within the Uni for contributors to this or similar initiatives. I think it will take some time for any formal recognition about contributions made through such a system. But informally, people are already expression gratitude to each other for having posted useful information, both on the system and in person. I’ll take this goodwill as “credit” anyday, though. I am right now preparing my first submission as PI and I could not have this idea in better regard! I have needed to pester senior faculty (mentors and collaborators) to work out the rules and while they have been very helpful, having a place where to ask questions would have been an advantage. I can see a further practical advantage: with time, many questions one may have will be already answered in the forum, where they can be accessed 24/7. This would be great when deadlines are looming and people around you may not be available with short notice. Cheers Joaquín! Having just come through the “junior” phase myself and struggling to come to grips with all the procedures needed to start a group is actually the main motivation for setting this system up. If something like this had been in place when I started, the last 5+ years of my life would have been a lot more productive and pleasant. Excellent point about the 24/7 availability. Given that we are often working late to hit deadlines or catch up on backlogs when offices are closed, having this knowledge available at any time of day is a big plus. It’s on the list now. 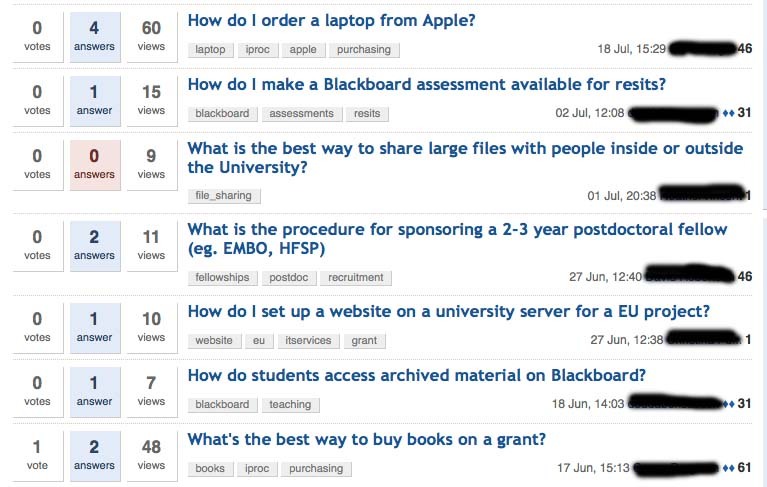 To increase uptake I think that it would help helpful to have a feed to the Faculty intranet. This would alert people who can answer a question, and also remind others to check the content. Gret idea Heather. Thinking about how to integrate the system into established communication methods will be part of the challenge of rolling this out to a wider user base. How does it cope with identical questions, posed in different ways – I assume this needs a human to identify them as synonymous? There is a lot of knowledge embodied in individuals – so linking to the appropriate knowledge holder may be useful. I am not sure “pestering” is a problem in the case of a grant application: much of info is part and parcel of learning how to polish an application. However, here again we are not effective: where is that up to date list of “people who know X”? The platform automatically text indexes each post by content and user supplied “tags”, then generates set of posts with high similarity (displayed on the right hand side of the screen when browsing). Related questions are also displayed to the user when entering a new question, which is helpful for preventing redundant posting. Redundant posting does happen in bigger online forums, but usually a senior moderator will link to an old post and close the new one to prevent answers from getting scattered among different posts. Part of the great thing about the StackExchange/OSQA model is that users can also be editors and moderators, which allows off-topic/inappropriate/redundant information to be edited by multiple people in the community, often in real time. This feature really enables community interation and helps focus what the forum should (and shouldn’t) be about. In an academic work setting, I think it will be important to have several senior moderators (admins) who represent various interest groups in the Unviersity, and can make sure that content properly reflects all aspects of the organization. I’m hoping that where real differences in philosophy arise in how to moderate/admin the system, they will be used to identify pinch-points for wider structural improvements in the University. Thanks – this looks most useful, please post regarding its reception! Excellent idea! Obviously a great asset for us junior staff, but what’s the motivation for more senior people to contribute (given they have a lot of experience). Trying to think of ways of selling it to then. Well, I’d hope that increasing the productivity, morale and retention of junior staff would be incentive enough : ). You could argue that it will ultimately reduce their workload, since they only have to answer a question once rather than N times. Additionally, I’m finding the system is an excellent place to make notes to myself for how to complete rare tasks (e.g. poster printing), so it might make their own (future) lives easier as well. Finally, the “kudos” system might be enticing to some, regardless of seniority. I think the “why contribute” issue is important, but won’t be restricted to any particular group. Any amount of contribution should be valuable, and the more useful the content is, the more engagement there from all ranks will be I suppose. I also love the community-building aspect to this – people who maybe don’t even know each other, in similar positions, may get to know each other this way, in a context where they’re all already helping each other, could be a great source of pleasant, useful, internal professional contacts, which can be soooooo hard to promote. Love this idea, would be really interested to hear of an update to this once it has been going longer. Thanks for your comments Aidan, it sounds like we have very similar views of how such a system could promote organizational efficiency and cohesion. You also hit on one of the key technical issues to achieve before the system can be rolled out more widely – linking it into our standard university authentication systems. This is important both for ease of use, but also to ensure real user identities. In fact this point was one of the key things to come out of my presentation to our management team, and one of the things I need to work on in the next phase of the project. Similarly, we also identified that to get the system to work in a professional setting, it will be necessary to formally describe what the rules are for use, as well as the responsibilities (i.e. “job description”) are for “admins”. I hadn’t anticipated this latter issue in the pilot phase of this project, but it is one that I realize now is needed to get commitment from, and allow time to be allocated by, a core set of staff who play a more intensive role in the building of the knowledgebase.